For those who like INF. A visual rework of inf_Warehouse. It's almost exactly the same as the original map, except for minor adjustments and polybug fixes. upd: I also repositioned bonus kit spawns for slightly better balance. - Added neutral player spawns. 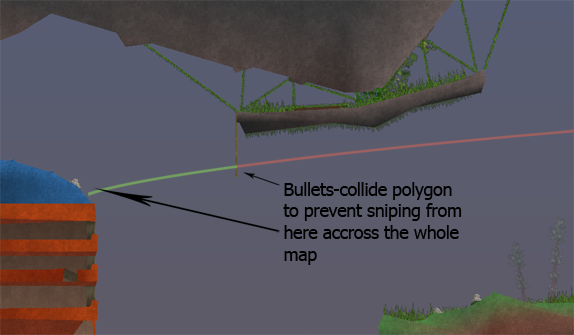 - Added rambo bow spawns. - Improved background colors and polygon shading. - Rebalanced bonus kit spawns. *removed the "lite" version from the archive since the difference in visual quality of both versions is now insignificant. *included a 1.5-compatible version of the map. - Reduced contrast and desaturated colors a slight bit to make them less distracting. - Added anti-spawnkill polys to Red base. - Removed tunnel backgrounds from both versions of the map. - "Lite" version has been adjusted to meet the default map requirements - all PNG sceneries removed comletely and some replaced with BMP sceneries. - Other minor tweaks and adjustments. - Completely redone polygon shading. - More trees and grass, more sceneries on Alpha base. - Clouds and sun in the sky. - Background sceneries for warehouse and tunnels. - Completely redone warehouse, to make it easier to get in and out. - Bottom and right part of the tunnel are now wider. It's a [visual] remake. It's same old warehouse, just with fixed polbugs, texture stretches, and better shading. I didn't intend to change layout in any way. Just the looks. i like it. is that an overview of the lite version? No, it's an overview of the "normal" remake. Lite version is almost exactly the same, except trees are more transparent (you can see it on the 2nd picture, which was taken in lite ver.) and there's no tunnel background. I'm diggin it. This is how maps should be "remade" unlike those in the 1.5.1 beta. There will be time when I create maps again. Great that you mentioned about the map, ran couple mins over your map. Seems good small modifications. If new scenery isn't causing fps issues (which I doubt not). I'll suggest the rl version for 1.5.1. Added rl version into #soldat.mapping inf server. That's nice to hear, thanks. I also remade inf_Fortress in a similar way, but I still need to change a few things. I'll post it once I'm done. I'd also want to add some of those new polygon types to prevent spawnkilling in Warehouse, but unfortunately polyworks hasn't been updated yet. If anyone else wants to do this - feel free to do so. however the polytypes will change more soon so you may end up with nonworking maps if you use new types. Yeah, and that.. In that case I'll wait a bit and release the updated version later, when it's more clear about new poly types. I'm glad you all liked it. Hoping to see it in 1.5.1. Next on my list is either rise or moonshine. I think Rise needs more attention. I like the style of moonshine. The only remake I actually like. Check your rar files. Both this and fortress are missing scenery (remember to add all custom scenery). Saw that now when unrarred this into Soldat that contains small number custom scenery. Updated. I only had sceneries that weren't on the default scenery list, but now I included them too just in case, as well as the texture. Updated to v1.1, see change log in the main post. Sorry for triple-post but.. MY MAP, MY THREAD, STFU GTFO MMK LOLOL? Page created in 0.262 seconds with 19 queries.